It wasn’t too long ago when we reviewed IM+; the all-in-one messenger. IM+ united various instant messengers/chat features from social networks and allowed users to manage their accounts from a single location. While it is a great solution for keeping in contact, there are also other options available out there. For example; there is Nimbuzz, which we have reviewed in the past as well; you can check it out here. These are welcome additions to any BlackBerry, especially since not everyone is a BB user; which means no access to BlackBerry Messenger. Don’t ask me why they don’t own a BlackBerry, that’s just silly talk if you ask me. Trillian was developed by Cerulean Studios; as I mentioned before it is currently in beta. Trillian is also available for the iPhone, Windows (7, Vista and XP) and through your browser on your computer (such as IE, Firefox or Safari). Cerulean Studios is also currently working on a Mac version, which is currently in Alpha. 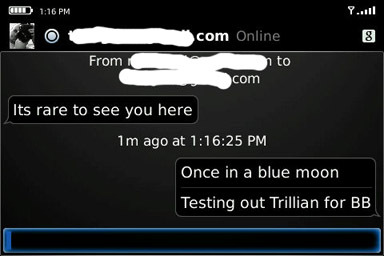 Trillian is available for BlackBerrys running OS 4.3 or higher. The current version is 1.0.0.220 and has a file size of 864.8KB. 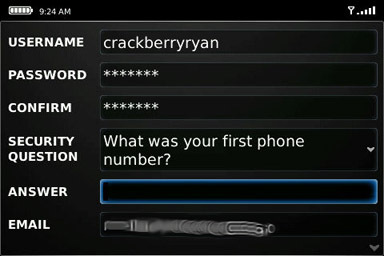 Before you can start chatting away with Trillian, you need to set up a free account. This can be done from the website, or directly from the application. I found that the ability to manage multiple Trillian accounts very useful. At the end of the day, I could sign out of my account for my work contacts and sign into my account for friends and family. That’s one way to keep one life from blending into the other. 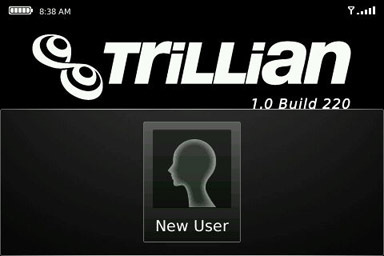 Trillian integrates nicely into your BlackBerry; users are notified with a home screen new message notifier, the LED indicator and speech bubble generated on top of the Trillian home screen icon. With Trillian, you can change the LED colour from red, green, blue or white. You can also hit up your profiles to edit the alert sounds for new messages. As I said before, Trillian gives you access to Facebook chat, MySpaceIM, Google Talk, Windows Live AIM/Mobile Me, ICQ, Jabber, Yahoo! and Trillian Astra. Set up for these accounts was fairly easy. When I set up Facebook, I initially saw a connection failure that seemed to fix itself within a second or two. After that, I was up and running; receiving instant messages, well, instantly. Your current conversations are displayed nicely in speech bubbles. You can actually see when the other person is typing (displayed as “…”). While you are chatting, you can also choose to send a photo. Without leaving Trillian, you can browse through your images or snap one yourself. The main menu of Trillian is where all of the action takes place. At the top, you can see your ugly mug (I mean your current avatar), your display name, status, as well as your battery level, signal strength and current time. Next to this, you will see small icons that indicate which IM accounts you are currently signed into. Below this, you can scroll up and down through contacts which are initially divided into active chats and online contacts. 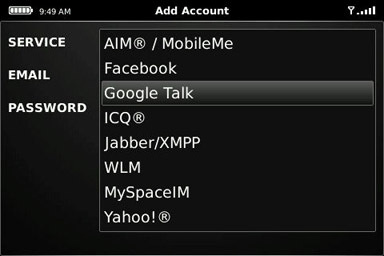 Trillian has your contacts grouped by account; Google Talk, Facebook, etc, but you can create and manage your own groups. For the sake of ease-of-use, Trillian hides offline contacts, but allows you to see them if you want to. Each contact also has an IM account icon, display name, avatar and status. For statuses, you can see if they are online or away. You can also set your own to away, invisible or create a personalized status. Now while it may not be necessarily fair to compare an officially released app to a beta app, let’s see how it stacks up against the recently reviewed IM+. Looking at the number of accounts the BlackBerry applications have access to, IM+ trumps Trillian with access to Twitter and Skype. Please note that the Windows version does support both Skype and Twitter, so hopefully we can see these included with the BlackBerry version in the future. I found the response time of Trillian to be slightly quicker. This, coupled with the simplified navigation options, makes for faster, more efficient access to chats. While IM+ seemed to be the more power hungry out of the two, Trillian appeared to be more memory hungry; within the past 30 minutes, I seemed to lose 3MB or so. As far as cost goes, I can’t honestly say how much the official version of Trillian will go for, but the iPhone version is currently $4.99, if that’s any indication. For a beta application, Trillian was fairly solid and looks to offer some competition when it becomes official. I’m not sure what features we will see, but it currently is more than able to handle your instant messaging. Its layout makes account management very easy and helps user quickly search through contacts. If I were you, I would give Trillian a whirl, especially while it’s currently free.